"Justify #7 ridden by jockey Mike Smith wins the 143rd running of the Preakness Stakes at Pimlico Race Course on May 19, 2018 in Baltimore, Maryland." Being able to predict anything in sports is usually near impossible. 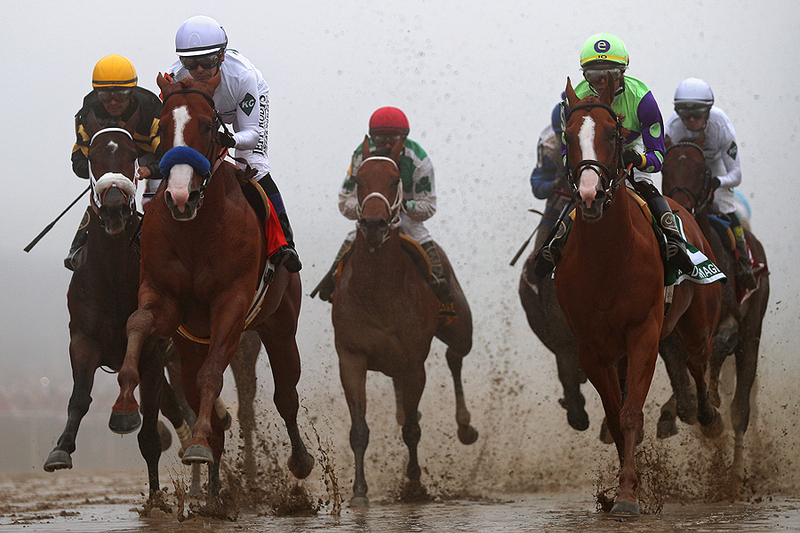 Anticipating the weather can also be a feat in itself - especially at Preakness. For what seems like the past five years, if not longer, the weather has played many tricks and posed lots of twists. One of the most memorable Saturdays in May being a fantastic sunny afternoon which was followed a monsoon of rain as the horses entered the gate. This year was no different as a heavy fog rolled in just around the start of the main race putting photographers to the test. Aside from the above remote photograph, my head-on position was like shooting into dark. Visibility was challenge, but made for interesting pictures. I always welcome weather that makes events different, and this foggy finish was one to remember.